Despite all the trade rumors and uneasy questions, the New Orleans Pelicans need to hold on to their talented point guard in Jrue Holiday. 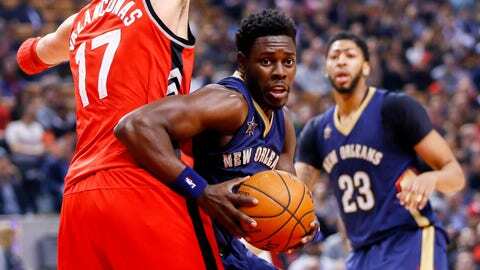 Jrue Holiday has been on the trade block rumors for the New Orleans Pelicans as of late. It is not the best idea of the Pels to trade him. Imagine this hypothetical, however unlikely, situation in which Jrue Holiday becomes the starting point guard for the San Antonio Spurs. If this scenario is scary to fans and makes the Spurs an even stronger team, then you can bet Jrue Holiday makes that big an impact. The NBA Trade Deadline is fast approaching on February 23, 2017. Holiday’s contract is expiring at the end of the season. This is causing an outbreak of rumors and questions are to develop, regarding his future with the Pelicans. With Anthony Davis being the face of the franchise, New Orleans has been trying to find the right pieces to surround their superstar player. But sometimes, trying to find the right pieces is almost like figuring out a puzzle. It can take some trial and error. The fact is Jrue Holiday has been a successful fit for the team and for Anthony Davis over his time in New Orleans. If this is still a puzzle, the team should be finding the right pieces to build around both Davis and Holiday, as the foundation. There is no question A.D. is the superstar. However, since Jrue Holiday’s return, he has been having an out-of-the-spotlight-stellar season. In his notably last 10 games, Holiday averaged 21.7 points, 8.2 assists, 4.7 rebounds, 2.1 steals, and is shooting 52.4%; all above his career average. In the right system, Holiday can be a destructive playmaker. A playmaker is what every team needs in today’s league. This is specifically important, as one of the weaker components of the Pelicans’ offense has been ball movement. Gentry also makes it clear in his interview that if Holiday had been with the team since the start of the season, there wouldn’t be any “doubt” it would have been “different” for the team solving all the inconsistencies thus far. The biggest concern about Jrue Holiday’s future with the Pelicans perhaps might not be of his abilities as a player but rather his speculative-upcoming salary he may be demanding. It may be difficult for the team and fans to cave into a $20 million-plus salary for Holiday. However, the fact about this price tag is that it is the new norm of the NBA. Recall last Free Agency. A handful of players were signing what some might call “villainous-like contracts”. Reaction to these inflated contracts had many questioning what on earth these General Managers were thinking. In any case, attention to ballooning contracts was especially noticed by future free agents. There is no way players in the league will ignore this new precedent. Players in the NBA are commodities. It’s all about supply and demand. There is plenty of demand for a player in likes of Jrue Holiday. One way or another, he will get paid. If the Pelicans are smart, they will dish out the dough. The most important truth to the Holiday trouble is the Pelicans aren’t in a rebuilding mode right now. They are in a tinkering mode. With Holiday and Davis as the faces of this franchise, they are the closest they will be to becoming a lethal team. Giving Holiday up to try and tinker more than necessary is not the right path for the Pelicans. Point Guards are plentiful in the league. However, it is very hard to find one of Holiday’s caliber.